Imagine being able to have the perfect tan in just 5 minutes … Well now you can do just that with a professional SunFX salon spray tan. Sunless tans are the healthy way to get that rich bronzed tan that we all desire, and at Elegant Permanent Cosmetics, we care about your health. 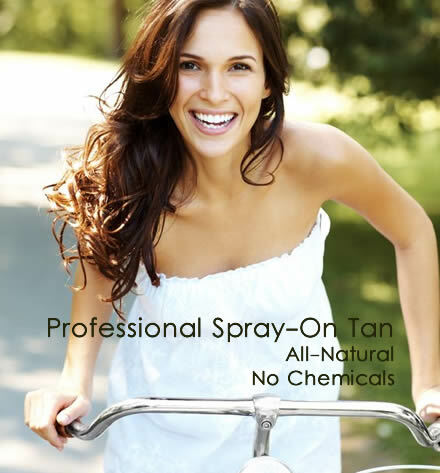 SunFX spray tanning solutions are 100% all natural – they don’t contain any chemicals. Our technician hand sprays your tan. Prolonged sun exposure can quickly age your skin, causing it to dry out and wrinkle. It can even cause skin cancer. Spray on tans that use harsh chemicals and additives can also damage your skin causing it to look weathered and old. But a SunFX all natural spray tan is the healthy sunless tanning alternative, offering perfect coverage for a fast, natural looking tan every time. SunFX is the fastest, healthiest way to get the perfect all over tan. Three Steps to achieving the ultimate spray on tan. Prior to receiving your SunFX spray-on tan we recommend you cleanse and exfoliate your entire body. It's important when exfoliating that you pay particular attention to rough skin areas like knees, ankles, heels and the tops of your feet as dry areas tend to absorb tanning solution faster, which can result in an uneven looking tan. Exfoliating prior to receiving your spray tan will help to eliminate the top layers of dry and dead skin. It is also best to shave or wax at least 24 hours prior to receiving your spray tan if possible. We also recommend cleansing your body after you exfoliate, to remove any remaining dry skin cells. On the day of your spray tan we recommend that you avoid the use of deodorants, moisturisers, perfume and make-up if possible as these may inhibit the effectiveness of the SunFX tanning solution. Clothing: It's important that you have suitable tanning attire to wear after your appointment. We recommend that you have dark, loose fitting attire to put on after your tanning application as some minor rub off can occur after your spray tan; and while minor rub off will easily wash out of most fabrics, some lighter coloured materials, including leather, may stain. When getting your spray on sun tan you may wear as little as you like or a full bathing suit. Most people wear just a G-String but this is a personal choice. All the spray tan technicians are fully trained to operate in a discreet manner and fully respect client confidentially. If you would like to wear something more than just a G-String during the application of your tan then we suggest a bikini for women and dark shorts or swimmers for men. Your spray tan will be professionally applied in a private room by a certified SunFX technician, using one of our world leading SunFX tanning solutions. The process only takes about 5 minutes after which your skin will feel touch dry. You will immediately notice a completely natural looking tan that will continue to develop over the next 5 to 12 hours. The application itself is quick and easy and certainly nothing to get anxious about. Skin: If you feel you have highly sensitive skin, or you have any doubts, we recommend a small localised test spray to check your skin compatibility before having your SunFX spray. Sunscreen: The SunFX spray-on tanning solutions DO NOT contain a sunscreen. Please make sure you apply sunscreen to prevent sunburn when outdoors. Now that your SunFX tan has been applied, you can reasonably expect it to last for up to 5 to 7 days depending upon your skin type and providing you follow the instructions below. Once your tan is applied you must leave it to dry completely. Your SunFX technician will ensure that your application is dry before you leave, but as a precaution, do not wet your skin for at least 5 hours after the tanning session. Showering the following morning is the best option. We recommend that you do not exercise or perspire excessively between the tanning and the showering phase. When showering do not be concerned if some of the initial bronzer washes off, this is part of the tanning process and your skin will continue to tan. When showering we recommend that you use SunFX Body Wash rather than normal soaps which can be abrasive which in turn reduces the lifespan of your tan. If you want to extend the life of your tan even further, then we would recommend using our sensational SunFX Tan Extender which will aid in the hydration of your skin thus extending the life of your tan. SunFX Summer's Secret is another excellent product to consider as it actually builds on your salon tan as well as hydrating your skin. And if you would like to highlight and extend your tan at the same time the you can't go past SunFX Body Shimmer - it's simply gorgeous. SunFX will, on nearly all skin types, provide an impressive and natural looking tan. In fact in many instances, the result of our spray tan can be superior to sun and solarium exposure. So to get your skin looking healthy and tanned make an appointment with a SunFX salon today.